Sauvignon Blanc is one of Sonoma County's most refreshing varietals. What’s in a bottle of Sauvignon Blanc? Wine, yes, but the arrival of two samples of Sauvignon Blanc from a noted Sonoma County vintner prompted another question: Should the shape of the bottle tell me something about the style of the wine? “That was my intention,” says winemaker David Ramey. His Sidebar Cellars 2016 Ritchie Vineyard Russian River Sauvignon Blanc ($34) showed up in a green-tinted bottle with gently sloped shoulders, common to the Burgundy region — but also the Loire — while his 2016 High Valley Sauvignon Blanc ($22) is packaged in a style of clear glass with more sharply defined “shoulders” that’s common in the Bordeaux region and is the standard Sauvignon Blanc bottle in California. The High Valley, with its mild suggestion of sugared white grapefruit and yellow tropical fruit, and merest hint of cookie dough and oak (half the wine was aged in older oak barrels, which don’t add too much of a “toasty” character, and half in stainless steel tanks), is a tangy, vinous, classic California Sauv Blanc. Back in the day, Ramey says, he visited with Didier Dagueneau and other luminaries of the Loire who helped to renew the region’s status as the reference point for Sauvignon Blanc. Fumé, you say? Haven’t I heard that somewhere before, as in Fumé Blanc? Indeed, Ramey allows that the late Napa vintner Robert Mondavi (winemakers here still call him “Bob”) invented the famous term Fumé Blanc to describe a rich, toasty barrel-fermented style of Sauvignon Blanc that was sold in a Pouilly-Fumé style bottle. Today, the category is a bit of a toss up: Dry Creek Valley’s Ferrari-Carano Winery sells a popular, partly barrel-fermented (in older oak) Fumé Blanc in a light-green Burgundy or Loire bottle, while Dry Creek Vineyards’ “pioneering” Fumé Blanc skips the oak entirely on its trip to a flint claret. Sorry to add to the confusion, but haven’t we seen that graceful, green Burgundy bottle somewhere else, too, where it hardly can contain distinctive notes of green grass and…kiwi? Yes, the New Zealand Savvies seem to mostly, if not always, show up on our shores in that style of bottle. But let’s get back to that Ritchie Vineyard SB: made from vines planted in 1972, and aged at least 90 percent in concrete egg-shaped vessels (Ramey says there may have been a few older barrels in the mix), the wine lets go a glimmer of the aroma of intangible yellow fruit, maybe golden grapes ripening in the sun, filtering through a dusting of chalk, accented with sweet, dry straw. Rich, but dry, the palate has an also intangible somethingness to it — stone, mineral? — while finishing with emphatic tanginess. Late to the show, green pepper pyrazines, hallmark of the varietal, drift in over a stony, not creamy, memory of concrete and lees. This bottle should look, and taste, its best on the dinner table! Founded in Healdsburg in 2014 by David and Carla Ramey, Sidebar Cellars is a “second label” of Ramey Wine Cellars, founded in 1996. Sidebar wines are made by veteran winemaker and consultant David Ramey and winemaker Lydia Cummins, who has been with the winery since 2008. Speaking of lemongrass and dinner, Chris Hanna, owner of Hanna Winery, offers this apropos refreshing recipe for Thai-inspired lemongrass tiger prawn salad from her own wine country cookbook, The Winemaker Cooks, describing it as a great do-ahead dish that tastes great at room temperature. Good idea—otherwise you might run out of Sauvignon Blanc while waiting one hour for the prawns to marinate! Peel the outer layer of the lemongrass, and then bruise the lemongrass with the heel of your knife to release the aroma. Cut the lemongrass into very fine crosswise slices and transfer to a large bowl. Add the lime juice, ginger, sesame oil, olive oil, garlic, kaffir lime leaf, salt, and pepper to the bowl with the lemongrass. Add the prawns and toss to coat. Cover and refrigerate for one hour. In a large sauté pan over medium-high heat, sauté the marinated prawns for two minutes on each side, or until just evenly pink. Do not crowd the pan. If you need to, work in batches. Transfer to a plate and let cool. Meanwhile, put the noodles in a bowl and pour over boiling water to cover. Let stand for five minutes, then drain and set aside. For the dressing: In a large bowl, whisk all the ingredients together. Add the noodles and toss to combine. 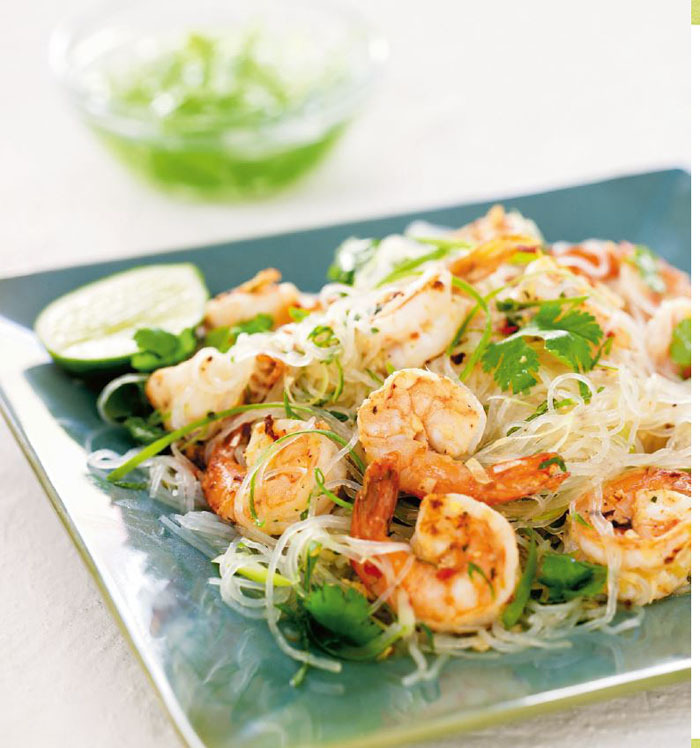 Add the prawns, chopped cilantro/fresh coriander, mint, and spring onions and toss to combine. Garnish with cilantro/fresh coriander sprigs.